Rational Emotive Behaviour Therapy (REBT) is practised all over the world and has many therapeutic, occupational and educational applications. Rational Emotive Behaviour Therapy: 100 Key Points and Techniques presents 100 main features of this system, to help therapists improve their practice. These essential points have been derived from the authors' own practice, and also from their experience as trainers and supervisors of novice rational emotive behaviour therapists. This concise and highly practical book will be invaluable to psychotherapists and counsellors in training and practice, ensuring comprehensive understanding of the REBT approach. Part I: Therapeutic Alliance Issues. Part II: Educational Issues. Part III: Dealing With Clients’ Misconceptions About REBT. Part IV: Technical Issues. Part V: Encouraging Clients to Work at Change. Part VI: Disputing. Part VII: Dealing with Obstacles to Client Change. Part VIII: Creativity. Part IX: Develop Yourself Personally and Professionally. 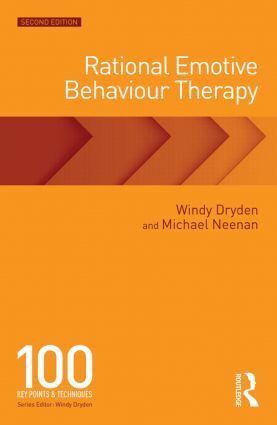 Windy Dryden is in full-time clinical and consultative practice and is an international authority on rational emotive behaviour therapy. He has worked in psychotherapy for more than 40 years and is the author and editor of over 200 books. Michael Neenan is Associate Director of the Centre for Stress Management and Centre for Coaching, Blackheath, and a BABCP accredited cognitive behavioural therapist. He has written and edited over 20 books. The 100 Key Points series are concise and practical introductions to approaches and modalities in counselling and psychotherapy. Ideal for those in training, or for professionals wishing to improve their practice.